I had the opportunity to attend Abstractions in Pittsburgh, PA after being graciously rewarded one of their diversity scholarships. Hosted by Code & Supply, this was the first conference of its kind but any attendee would have never known it - too many sessions to choose between, plenty of friendly faces volunteering, and a community that was growing before the conference even began via Slack and social media. The conference offered a variety of activities for attendees to partake in after-hours, which was great for me coming out of town yet still wanting to get to know Pittsburgh a bit during my stay. One evening, speaker Matt Griffin of Bearded Studio hosted the premiere of What Comes Next is the Future, a documentary about the web, told by the people who build it. The event was hosted at The Harris Theater, which was already on my list to visit during my stay. Since attending, I’ve already showed this film to numerous coworkers and colleagues; if you have an hour to spare, it’s a great holistic look at what’s gone (and it going!) into the web. Many of the sessions I attended shared the common thread of mentorship. Erika Carlson shared the process that Detroit Labs uses in training their junior developers in a 10-step format. The biggest takeaway from her list for me was engaging junior level team members in the process of finding an answer - don’t let them flounder on their own while also not just giving them the final solution. Joseph Matsey touched on more strategies teams can use in order to be sure they’re consistently learning (and learning together) - using guerrilla learning tactics like lunch workshops, book reviews, and trying to avoid only learning things as projects dictate them can all help teams looking one step ahead rather than putting out fires. Brad Frost and Micah Godbolt both shared their thoughts about using design systems as a part of the web process. Brad shared some great examples of inconsistent UI of well-known brands and then talked through how this can be avoided through using pattern libraries, style guides, and addressing earlier in the design process. Micah compared using a design system to the “Road Runner Rules” - guidelines that animator Chuck Jones gave to his entire team (writers, developers, illustrators, etc.) in order to create consistent experiences. Both touched on how thinking this way isn’t easy, it requires planning for a bigger, messier world and embracing fluidity. As I said, Abstractions was overall a great experience and I learned a lot while solidifying other things I had already read or heard of in my own independent learning. 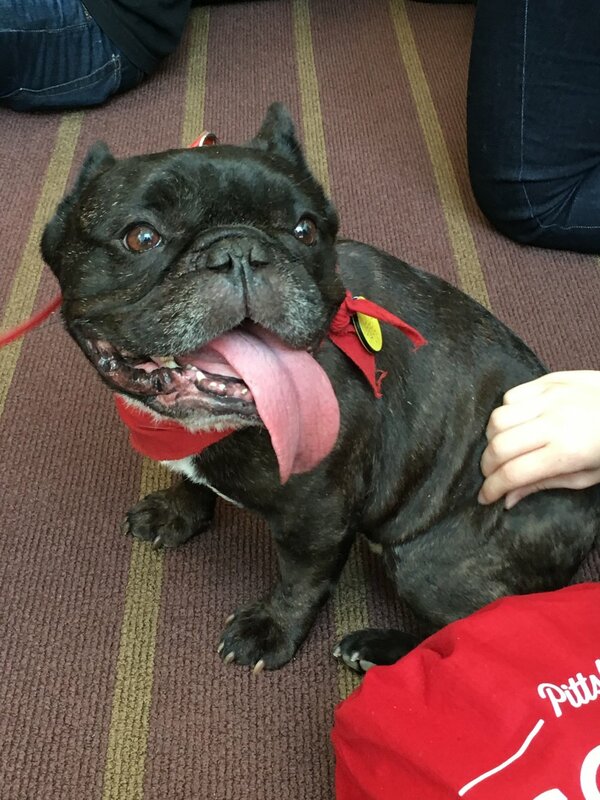 If a therapy dog session is included every year, sign me up again!